Thank you for reading PracticeLink Magazine! Already registered? Click here to see the Spring 2019 advertisers. Enter to win a $500 AmEx gift card! Which best describes your plans? When could you be available to start? If applicable, when would your spouse be available to begin in a new position? Any more details about where you would like to practice geographically? Please send PracticeLink Magazine to the address I've listed. This is a new address, and I need my subscription information updated. 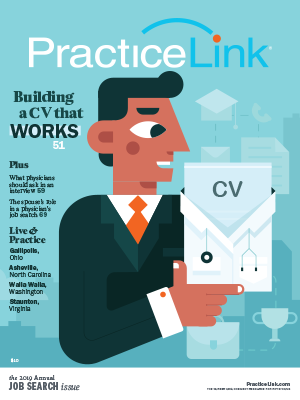 I would like to receive occasional emails from PracticeLink with career tips and magazine highlights.